Formed in Carson City, Nevada in 2011, and as a Christian rock band, I Am They have been playing hard while reaching out with their music. 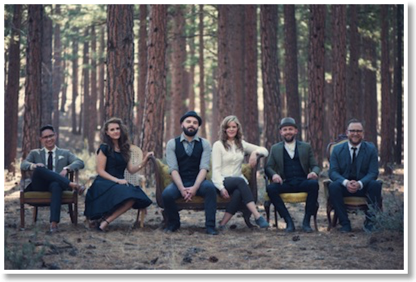 After four years of musical work, the six musicians have released their first self-titled album this past January, with it peaking at 10th place on the US Christ music charts. The band recently participated in the Rock and Worship Roadshow Tour with Christian Rock veterans MercyMe and Crowder, and will be on tour in the fall across the U.S. In this interview drummer Sara Palmer talks about how the group began and what keeps the band together. Pablo Suarez: Let’s talk about your band. How did it come together to play music? And why? Sara Palmer: Our band began as a local worship ministry based out of rural Nevada, where it is not only dry geographically - but also spiritually. We have a heart for the church and wanted to see our church community unite. So what started out as a one-time worship concert on Halloween night in 2008 ended up continuing on every 6 weeks or so for the next 7 years. I myself started out as the “behind the scenes” person in that ministry; I came up with the themes and designed the flyers, as well as creating the stage décor for each of the worship events. I was also in charge of setting up and running the lyrics. It wasn’t until much later into this ministry’s stride that I became a member of the band. We ran out of drummers in our small town and so I [timidly] stepped into the position. You seem to have different musical influences in your songs such as folk-pop. Can you say specifically what are your musical influences are? Stylistically, and how does that help your group when they perform? I love pop rhythms. I always have. Give me a tasty beat that you can bob your head to and I’m all over it! I also get giddy when I hear anything that has a drumline rudimentary feel to it. Musically, you can catch me listening to artists such as NEEDTOBREATHE, Punch Brothers, for King & Country, and, yes, even Taylor Swift. But lyrically I love artists like Christy Nockles, Jon Foreman, Tim Timmons, and John Mayer. Our band is greatly inspired by creative musicianship and clever lyrics. In Christian music, that has the ability to translate very emotionally, in both areas, because we are playing and singing for so much more. Who do you feel has impacted your music? Which bands? And how has it helped your playing? I started out playing worship music and sort of got “thrown into the fire” having to learn 20+ worship songs for my very first performance. I would practice for hours, learning every fill from front to back. So a lot of those songs root deep for me. Some of these initial impacts were from artists like Hillsong United, the Passion crew, Phil Wickham, and Gungor. As our band has moved from worship ministry to our current role as recording artists, I’ve learned a lot from my newfound peers. This transition has expanded my creativity and has really opened my playing style up to be more creative and to try new things. Where does your love of playing the drums come from? And do you feel your style of drumming has been shaped by other drummers? If so, which musicians have made a difference? My love of drums comes from my Dad. He played drums in high school and, for as long as I can remember, I have always wanted to play. It wasn’t until I was almost 30 years old that I really took the initiative and to start playing. I can definitely say that my drumming style has influences written all over it. Probably my biggest drumming influence is Paul Mabury (One Sonic Society). Other inspiring drummers include: Timmy Jones (for King & Country), Steve Jordan (John Mayer), Richard Scott (Matt Maher) and Terence Clark (Gungor). Of those guys - whom I think are all great - I believe that Paul and Richard have had the biggest impact on me personally. Both have taken the time to sit with me, work with me, and encourage me in my own skill. I appreciate that very much, and it makes a huge difference in how I choose to play. What sort of issues do you address with your music? How do you feel it has helped the band’s music? This album is our heart’s journey in song form. We wrote about topics that were and are very real to us as we were walking through them. Topics like our spiritual walks with God, declaring the truth about who God is, and how He reaches into our individual lives. What has been fun for us to see is how listeners and other believers find it very applicable to their own hearts and walks. Would you like to say anything else about the music of I Am They? Your hopes and goals? Our bass player has put it best; “God is fulfilling dreams in our hearts that we didn’t know we had.” Our goal is to bring Jesus glory and our hope is that He continues to use this music to speak to the hearts of those who need it.